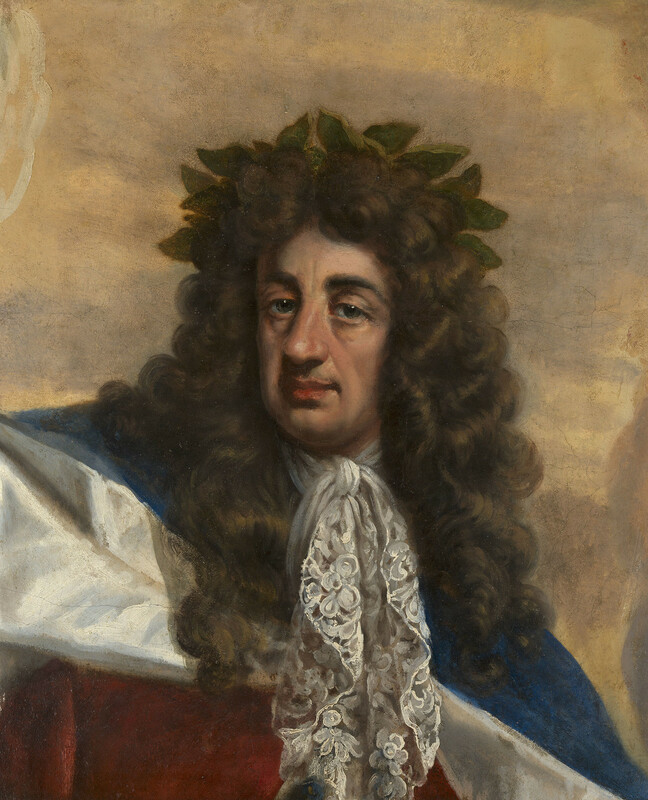 Antonio Verrio worked at Windsor between 1680 and 1684 painting decorative schemes throughout the state apartments, created by Charles II for himself and his Queen. Of the seventeen illusionistic ceilings only three survive. The greatest loss however came when George IV knocked together the King’s Chapel and St George’s Hall to make the larger St George’s Hall the space of which survives today (though itself remodeled after the Windsor fire of 1992). These two rooms (King’s Chapel and old St George’s Hall) were Verrio’s masterpiece and the most Baroque space in England, with painted illusionism along the walls (complex architectural forms apparently opening onto further rooms) as well as on the ceiling (the vault apparently opening onto the sky). When the vault of old St George’s Hall was broken up someone clearly saved this section of plaster, depicting the climactic figure of the King. Historic views of the interior show this episode in the centre of the central painted field on the vault and show the King being crowned by two allegorical figures.